Just a few months ago, before gas prices made a U-turn, the American press couldn’t talk enough about scooters. Among other brands, Vespa was identified as the euro-cool scooter to see, and be seen on. 50, 60, 70 and even 80 miles per gallon of gasoline gave us an excuse to go out and buy something fun and new. Since we occasionally test large displacement scooters here at MD, we asked Vespa to try one of their 244 cc models, the GTV 250. 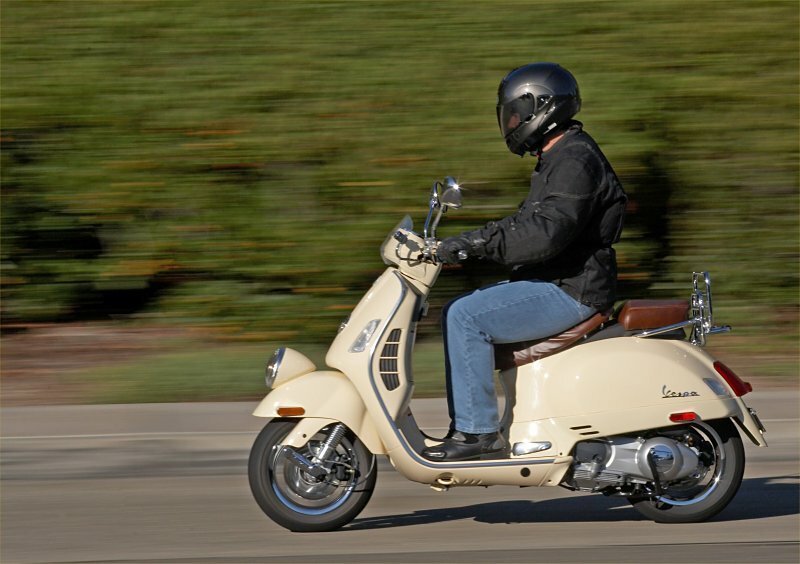 At $6,899, the GTV 250 is by far the most expensive scooter sold by Vespa in the United States. 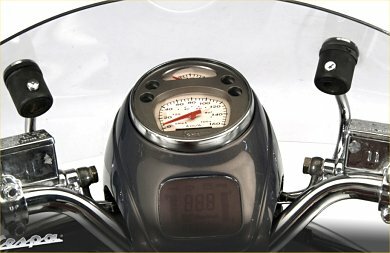 In addition to having the largest displacement engine available from Vespa in this country (the same engine is available in the less expensive GTS 250), the GTV features a relatively luxurious leather saddle, front and rear disc brakes, cool retro styling (including a fender mounted headlamp and retro instrument gauge), standard chrome luggage rack, fuel injection and liquid cooling. 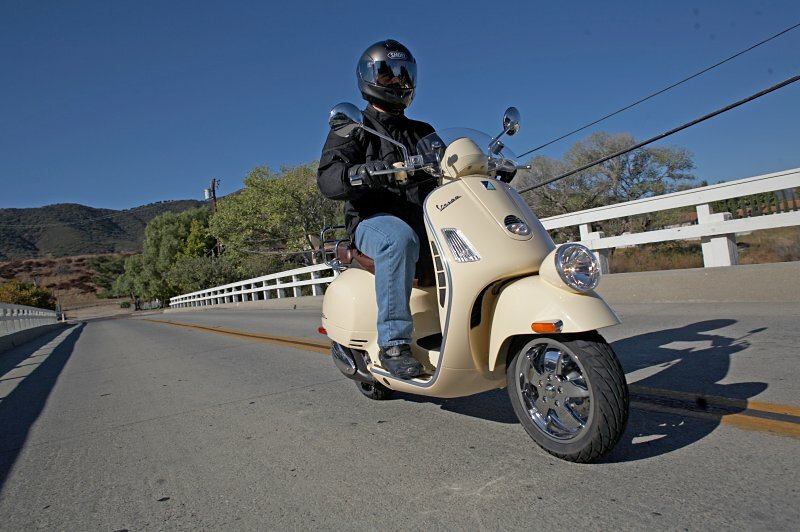 Vespa claims a top speed of 76 mph and fuel consumption of 65 to 70 miles per gallon. Our testing yielded 62 mpg. Riding a Vespa, or other small scooter, is not like riding one of the mega-scooters (such as a Suzuki Bergman 650). Your upper body is much more exposed to the wind, and the machine, as a whole, has a simpler, more toy-like attitude. With the smaller 12-inch wheels found on the Vespa, braking and cornering needs to be a bit more measured than it need be on a scooter with 14 inch or 15 inch wheels. Nevertheless, the disc brakes on the GTV 250 proved adequate, if not confidence inspiring. In the handling department, it tends to “dart” more than “flow”, and this just might be appropriate for its primary purpose of city traffic negotiation. When I returned the machine to the press representatives on the other side of Los Angeles, I rode it nearly flat-out on the freeway for approximately 100 miles. Top speed, as indicated, varied from 75 to 85 mph depending on wind direction and incline. Stability was adequate if not quite at the level offered by a full-size motorcycle or larger-wheeled scooter. This is not a freeway touring machine, but it offers adequate power and stability to use the freeway for relatively short hops — making it more versatile than many other small scooters. Styling is always subjective, but we thought the bike looked very cool. You don’t see genuine leather saddles very often, particularly in dark brown, and the rest of the bike has a certain retro-yet-modern attractiveness and simplicity. If you are looking for something somewhat out of the ordinary here in the US, and enjoy genuine Italian styling, the Vespa GTV 250 might be your scooter. The less-expensive 244 cc model, the GTS 250, retails for $5,999 and offers the same performance (without some of the styling elements). 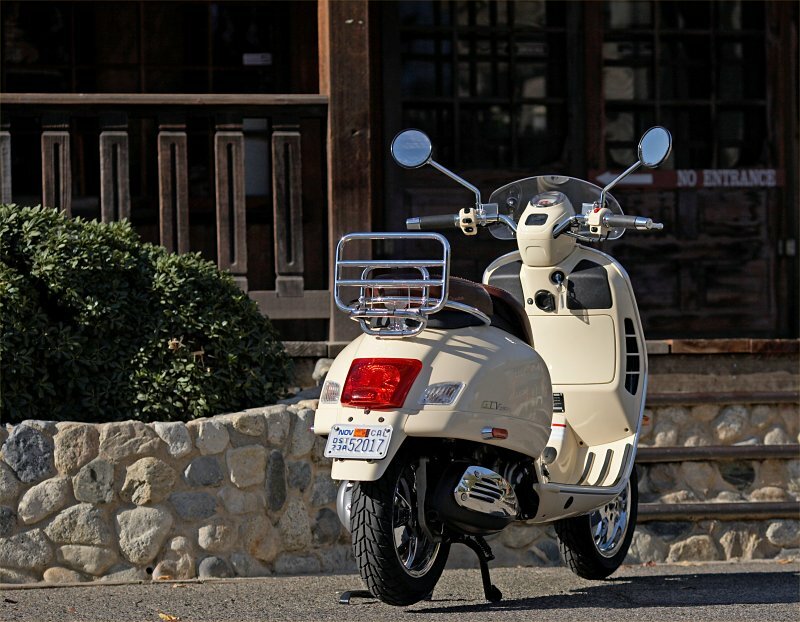 Take a look at Vespa’s website for additional details and specifications.